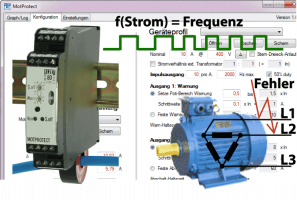 Current-to-frequency conversion and level monitoring of asynchronous motors for overload ("container full" for screw conveyors @ 1.5 of nominal current) and block (obstruction @ 8 fold nominal current). Digital outputs allow immediate action to prevent lockout or blowing the fuse. History storage of problem courses for analysis of faults and wear. Starter kit with a PER-MOTPROTECT37 and a USB-IRDA. This set is designed for testing in your project. Maximum of 2 sets per customer! Standard MOTPROTECT for 3..37kW motors with adjustable, current proportional frequency output and two alarm level switches. 3000 samples EEPROM history storage. 3..37kW MOTPROTECT with additional cosφ and voltage measurement. DataFlash® extension for off-line storage of more than 500,000 current samples based on the configured trigger conditions. Option, adds to base module price. USB to infrared adapter necessary to configure and read out MOTPROTECT. Service technician use only - MOTPROTECT works off-line and alarm levels can be adjusted using the potentiometers on the device (if enabled). Reliable PC-communication with 115.2 kBit/s. Requires Windows®-2000 and up. Three-phase asynchronous motors driving compactors, balers and similar machinery have to be monitored for excessive currents in order to detect overload situations or even blocking. 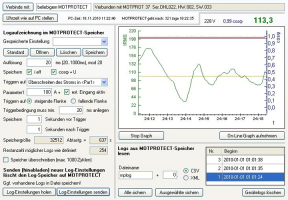 MOTPROTECT provides a current-proportional frequency that may conveniently be counted by any standard PLC. The 14-bit analog input gets continually converted (every 20ms) to the output frequency. 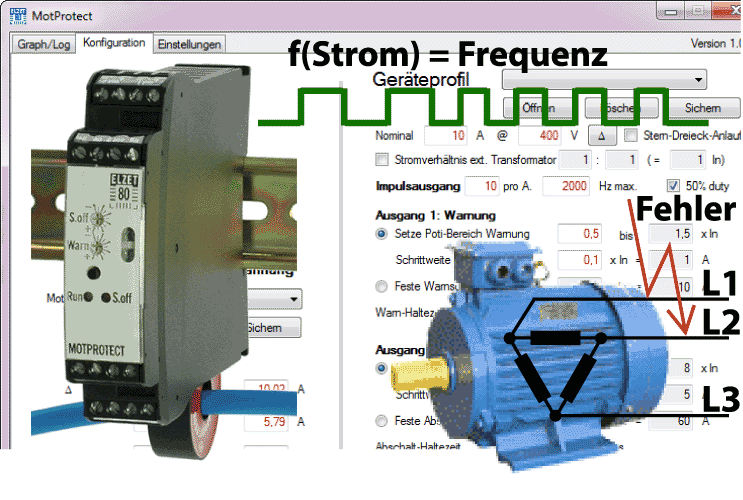 The conversion factor (how many pulses per Ampére) can be set in software to match the input capabilities of your PLC. Analysing the current can not only help to decide when to shut off, but also to detect long-time wear or residue. Continuously calculating a temperature model of the motor might allow using a smaller motor while introducing off-times when needed. 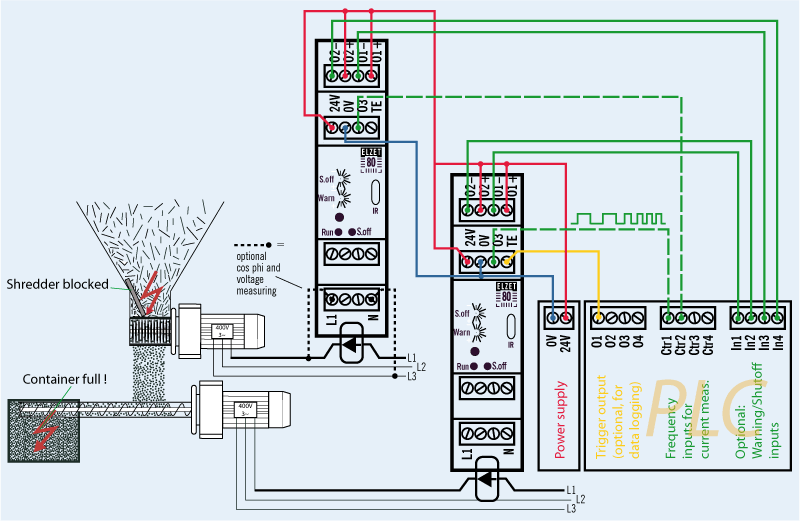 Optimising the PLC for high resolution calculations requires long acquisition times that contrast with the need to shut off within less than 100ms in a real block situation. 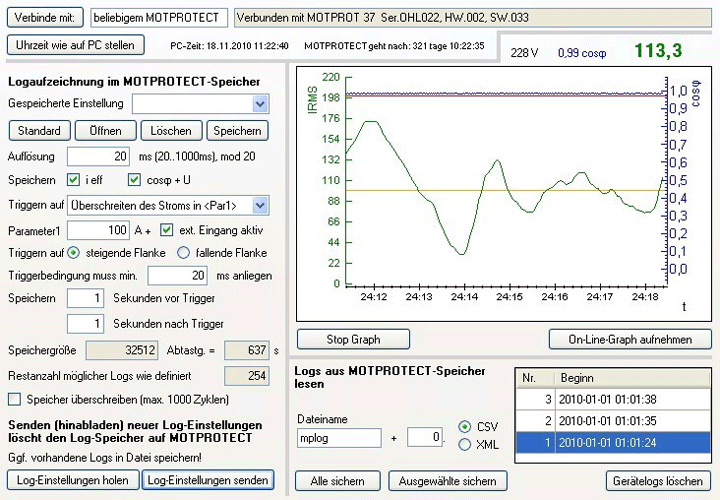 Here MOTPROTECT uses its internal data probed every 20ms to decide about a critical situation and raises a 24V output (optoisolator) to shut off immediately - either through the PLC or directly actuating the motor relay. Making use of the powerful little processor in MOTPROTECT, the unit comes with comprehensive configuration software that allows to set the alarm levels fixed (such that the pots on the device have no effect) or adjustable with endpoints and tick steps tunable to field requirements. 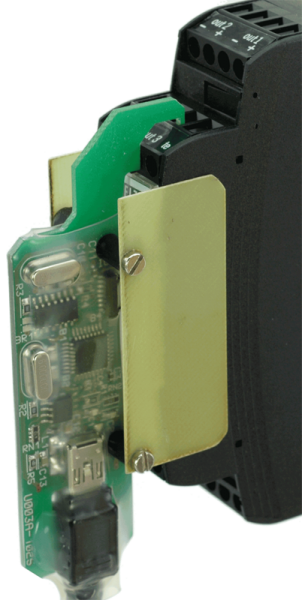 PC connection to the unit is well isolated with a USB infrared transceiver at 115.2 kBit/s (USB-IRDA) that can be held at distance or hung to the device. A chart is shown in the graph tab of the PC software while connected, it can be saved as CSV for later Excel® or data base integration. A separate plot utility allows you to look at stored data with adjustable window and scale sizes. The big advantage over passive devices is the option to store histories of current courses to the device internal EEPROM. Log storage is conditional and can be triggered by the current passing shutoff or warning levels, a manually defined level, or an external input. Times before and after trigger can be adjusted as well as the acquisition timing. Standard memory is 3000 points, an optional data flash stores 500,000 points. Connection to a control unit (PLC, TSM, DinX etc.) for the example of a shredder and a screw conveyor. An item blocking the mill enters into the shredder. 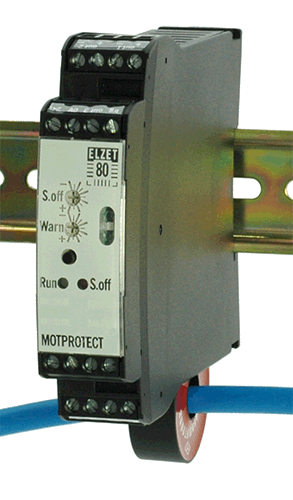 This will cause a steep increase of the motor current that MOTPROTECT will detect. Using the shutoff output allows to switch off the motor before its thermoswitch trips. The container of the screw conveyor press is full. 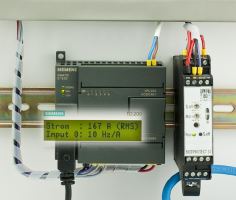 The controller counts an increasing frequency from MOTPROTECTs current proportional frequency output and decides to switch off the motor before it overheats. To teach the controller, it can issue trigger events to MOTPROTECT's TE input to take snapshots of different load situations, possibly for different containers. The logs can be analyzed from the PC software. MOTPROTECT allows many creative extensions. We are happy to develop hard- and software around the MOTPROTECT core for your requirements. For bigger motors simply add an external current transformer and enter the transfer ratio into the configuration dialog. Current values will automatically be recalculated as well as values for trigger and graphics. For smaller motors, an easy trick is to feed the motor wire some more times through the sensor coil. Current will be measured proportionally. In this case, however, there is no reflection in the configuration. The powerful little processor on MOTPROTECT still idles most of its time. 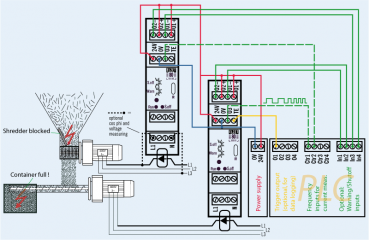 Hence, if you want to let it do some other control, there's the option to use a double wide enclosure for 16 extra terminals that could serve as inputs or outputs. This of course requires one time costs that won't be economical below 100 units per year. 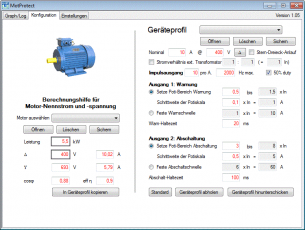 There might be many options to improve the software to make it ideally fit for your application - like a fill level estimation from the current required, temperature control or wear statistics. If you have a model to follow, extending the software will be pretty easy. If you need to explore, MOTPROTECT can help you to acquire the necessary long time measurements. Just ask - we are happy to discuss the options. The smallest PLC-CPU from Siemens (SIMATIC S7-200er Series) comes without frequency counter inputs. Due to the integrated high speed counter and interrupt blocks, however, a frequency measurement is still possible. The integrated high speed counter gets read and reset every 200ms (gate time) by an interrupt routine. The number of counts gets transformed into the equivalent current and is displayed on the LCD. As an example it is shown as a rising number of output LEDs, too. 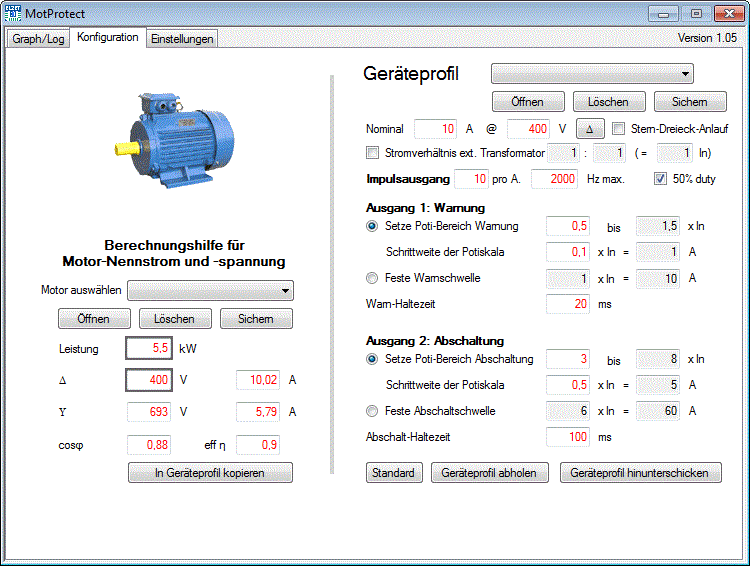 The current measured is also available in the double word variable VD10 for your application. MOTPROTECT-Software* v1.06 - delivered as an *.msi installation file for installation on Windows (Windows 2000 and up). The installation includes the user's manual.